Unique and baffling construction details on the replica Dover Bronze Age boat. I say baffling because the replica was unsuccessful, so even its builders didn't understand how some of these features worked. Photo from Robin Wood. 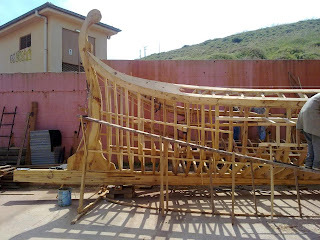 One of my earliest blog posts was about the Dover Bronze Age boat, and a few months later I reported on the early stages of an effort to build a replica (or recreation), to test archaeological theories about what the missing parts of the boat were like, and how it performed. That recreation effort came to a disappointing conclusion recently, when the finished boat failed to float, as reported in Robin Wood's blog here. At the bottom of that particular post are links to all the previous posts detailing the project. And Robin's next post, here, contains more of a wrap-up, including more photos of the finished boat and the news that the replica was named Ole Crumlin-Pederson, for the renowned boat researcher who consulted on the project and who passed away before it was completed. Thanks to Edwin Deady of Dark Age Boats for this news. "Adem Ali Yılmaz tells us that this is being built at a high school in Turkey and that the dimensions are length 19 meters, beam 4 meters." I don't know the provenance of the design: it appears similar to ancient Greek ships, but similar designs were probably used by other nations throughout the Mediterranean. The Persian ships at the battle of Salamis, for example, were roughly similar to the Greek ships against which they fought, and Turkey lay within the Persian empire at that time. See my comments about the bow of Tim Severin's Argo, then look at the details of the bow construction here. The keel appears to be laminated. The structure of the stem, however, looks pretty authentic. On the other hand, I believe that Bronze-Age Mediterranean boatbuilders used no forms in their shell-first hull construction. If that's the case, then the use of forms and ribbands here is not a historically accurate method. That issue aside, this is an ambitious and impressive project for a high school and I wish them luck and success. I sure would like to know and see more about this project. Here's an interesting video from the National Film Board of Canada showing the construction of a kayak by Netsilik Inuit people using almost entirely traditional methods. Filmed north of Hudson Bay in 1967, the family shown was apparently living a traditional indigenous hunting/gathering lifestyle, using skills learned through natural cultural transmission. In other words, it's the real, rare thing, not a conscious effort by the participants to preserve or recreate a vanishing heritage. The video is oddly edited, in that the construction steps shown are somewhat episodic and almost seem to have been randomly selected. (They are, however, in proper chronological order.) 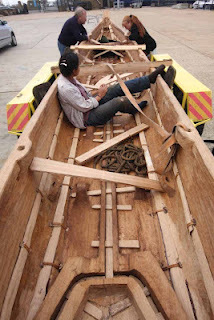 For example: although we see the cockpit coaming being installed, we don't see the construction of the coaming prior to its installation. Additionally, many minutes of film are consumed by scenery and nature shots -- nice enough in their own right, but not terribly useful to those of us interested primarily in the boat and the culture. Most seriously, there is no narration (indeed, the soundtrack doesn't start until two minutes into the film), and I suspect that much of what is shown will make sense only to viewers who have some knowledge of kayak construction and building methods. But for those who understand what they're looking at, there's a wealth of useful detail. When the kayak frame is being lashed together, for instance, it's interesting to see how immensely strong a thin strand of sinew is: the builder seems to pull it tight with all his strength and it does not break. Generally, it's fascinating to watch the builders' use of tools and to see the specific techniques used in various stages of construction. One only wishes that it was more comprehensive and less eposodic (i.e., disjointed). From what I can discern, the only aspects of construction not entirely traditional (i.e., pre-European contact) is the sparing use of steel tools (limited to an ulu knife, a knife of more European pattern, and a steel sewing needle), and the use of milled lumber for the main rails (gunwales) and perhaps some of the other longitudinals of the kayak frame. In Greenland, where European contact first occurred centuries prior to the Canadian Arctic, most or all of these technologies were adopted by the native people quite quickly, so their use here represents "modernization" of a rather modest extent. Thanks to David Ferch for pointing me to this source.